Day of traveling today, very dull until after four trains we arrived at Gatwick only to discover we had tickets from Heathrow, Bugger. It was then far from dull trying to make our flight, but a million pound taxi did the trick and a few hours later we were in Geneva catching a bus to Chamonix. 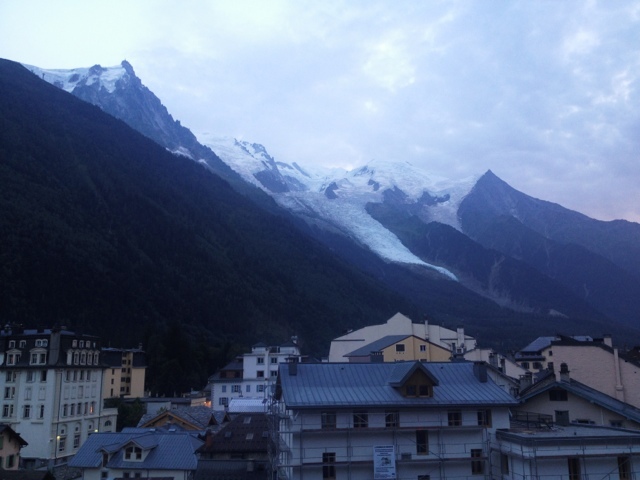 Check the view from our balcony, that's Mont Blanc, sweet. Hi Marcus, we're still following your exploits with baited breath. It's exhausting just looking on. Do you ever wake up wondering where the hell you are? Anyway, keep up the good work - we love the updates and the pictures. When do you expect to be back in Melbourne?